Kiptik means "inner strength" in Tzetzal, the language of the biggest indigenous group in Chiapas, Mexico. We are a UK-based solidarity group who have been working on a series of projects in the autonomous communities of Chiapas in South East Mexico, since May 2000. 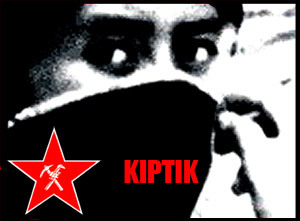 The aim of KIPTIK is to support the Zapatista struggle directly through the construction of drinking water systems, ecological stoves, health and mural projects. We think that hands-on solidarity work is a way of joining struggles and cultures worldwide in order to find common ground and shared solutions to the problems we are all facing. The work of KIPTIK has grown according to the needs identified to us by the communities where we've worked. We try to work with people at a community level rather than with large, remote institutions. We work directly with the Juntas de Buen Gobierno ("good government assemblies") to try and help them meet their own needs. We want to keep our projects small and human-scale, and to promote self-sufficiency by leaving skills and materials in the hands of the people in the communities. Wherever possible, we try to use appropriate technology solutions: i.e simple, low cost, efficient and easy to maintain. All funds raised go directly towards project costs. No KIPTIK members are paid, and their work is entirely voluntary. KIPTIK operates through a central working group, where decisions regarding the work are made collectively. This group is open to those who have been involved in supporting KIPTIK and its work, and is accountable to all those who have donated money to the projects or supported KIPTIK in any way. This website highlights our main areas of work in the autonomous communities of Chiapas. We dedicate this site to them.